Why we won’t intervene in Lagos chaplain sack – CAN – Royal Times of Nigeria. 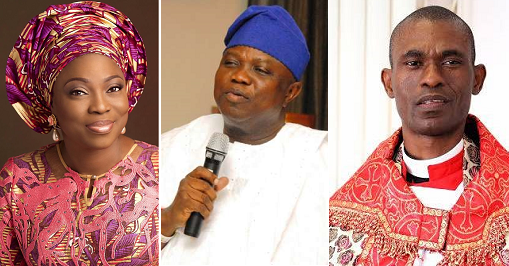 President of the Christian Association of Nigeria (CAN), Dr Supo Ayorinde has said the association will not intervene in the sacking of the chaplain of Lagos State chapel, Reverend Femi Taiwo for allegedly disrespecting the wife of Lagos State governor, Bolanle Ambode. Ayokunle speaking in an interview with journalists said that CAN cannot intervene in a matter it was not informed about. He said; “None of them has briefed me on the matter up till now and you don’t continue to look for trouble here and there. If they feel they can manage the trouble themselves, well, I won’t be looking for trouble,”. “I ‘will only pray that the matter does not go beyond their control, which is good for me, because it makes me to rest my head and face other matters”. “They never brought it to my table at all; either that chaplain that was concerned or his church. The chaplain is from my bloc, the Christian Council of Nigeria, and the Primate of his church is my friend. None of them has taken me into confidence over the matter. The Lagos wing of CAN didn’t contact us and our rule is that whatever could be managed by other agencies of CAN, the national leadership would not intrude into it. “The local government chapter of CAN, the state wing of CAN, none of them has brought the matter to the national secretariat at all and it is not good for me to be commenting on whatever offence or who is right or wrong on the pages of newspapers. As a leader, I don’t want to rubbish the image of the organisation. “I was not taken into consideration when the appointment (of the chaplain) was being made up till the time the contract was terminated. I wouldn’t know what was in the terms of the appointment. So, it would be foolhardy for me to be acting as if I was the one in charge of the organisation in which the man served. I cannot say I don’t know the man face-to-face. However, that is not an excuse if he has a problem.